The Name conveys. It is big and well located. Top lounge has a great view. They could have a better musicians nevertheless it is a worth to visit. 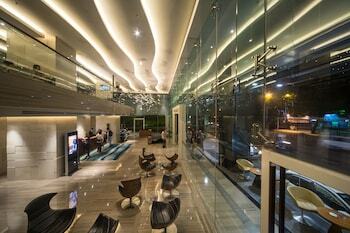 Where to find Ho Chi Minh City hotels near an airport? How can I find hotels in different Ho Chi Minh City neighborhoods? Where can I find hotels in Ho Chi Minh City that are near tourist attractions? 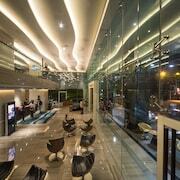 Should you be seeking great hotels and apartments in Ho Chi Minh City, you're simply spoiled for choice. Spend some time checking out our 512 hotel options, which are all within a 0.1-kilometre (0.06-mile) radius of Ho Chi Minh City's center. 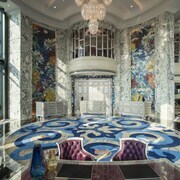 The Park Hyatt Saigon and Sheraton Saigon Hotel And Towers are the more centrally located hotels in Ho Chi Minh City. Saigon River is an excellent neighborhood to stay because it has 56 hotels that can be booked through Expedia. Saigon River is 0.5 kilometres (0.3 miles) from the middle of Ho Chi Minh City. 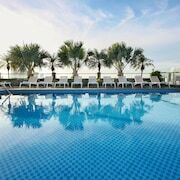 Hotel options include the Caravelle Saigon and Renaissance Riverside Hotel Saigon. Pham Ngu Lao Backpacker Area another Ho Chi Minh City hotel district is 2 kilometres (1 mile) from the center of Ho Chi Minh City. There are 95 establishments in Pham Ngu Lao Backpacker Area, including the Elios Hotel and Vien Dong Hotel. Another option is to find accommodation in Ba Queo, which is the neighborhood where you'll find the TTC Hotel Deluxe Tan Binh and Hung Anh Hotel, or Tan Binh, which is home to the PARKROYAL Saigon and First Hotel. The Bizu Boutique Hotel Phu My Hung and Golden Ant Hotel are in Tan Qui Dong, while Bizu Hotel II - Phu My Hung District 7 and One World Hotel are part of the Tan Thuan Dong area. Travelers on a budget will be pleased to learn that there is a broad range of cheap and cheerful accommodations in the vicinity of Ho Chi Minh City. 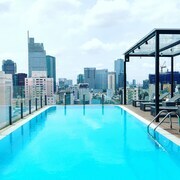 The Cap Town Hotel is 1 kilometre (0.6 miles) from the center of Ho Chi Minh City, while the Alagon Central Hotel & Spa is 1 kilometre (1 mile) away. Alternative budget room options are the King Star Hotel Thai Van Lung and the A&EM Corp - Le Prince Hotel. The An Lam Saigon River is 11 kilometres (7 miles) from the heart of Ho Chi Minh City. 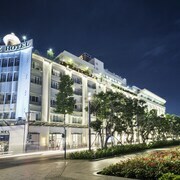 Alternatively, the InterContinental Asiana Saigon is 0.6 kilometres (0.4 miles) away. 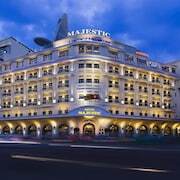 The Sedona Suites Ho Chi Minh City and also the Hotel Majestic Saigon are other alternative hotel options around Ho Chi Minh City. After you have got a feel for Ho Chi Minh City, why not travel a bit more of the area? The Southern Vietnam region has plenty of things to see. Southern Vietnam offers rural landscapes and beaches, and commonly visited Southern Vietnam attractions include ruins and traditional villages. Fun-loving travelers might enjoy hiking and cycling here. Ben Thanh Market is 0.9 kilometres (0.5 miles) to the southwest of Ho Chi Minh City and is home to the Mariamman Hindu Temple and Galaxy Nguyen Du. If you'd like to spend a few nights in Ben Thanh Market, check Expedia's booking pages for the latest deals at the Sofitel Saigon Plaza and Lotte Legend Hotel Saigon. 4 kilometres (3 miles) to the southwest of Ho Chi Minh City, you'll also find District 5 - Cholon, home to the Hotel Nikko Saigon and New World Saigon Hotel. The Phuoc An Hoi Quan Pagoda and Cholon Jamail Mosque are a couple of the most popular points of interest to explore when visiting District 5 - Cholon. If you are planning on arriving or departing via Tan Son Nhat International Airport, you may choose to book a room at Rex Hotel, or Somerset Ho Chi Minh City, both of which are a short drive away. Are there hotels in other cities near Ho Chi Minh City? 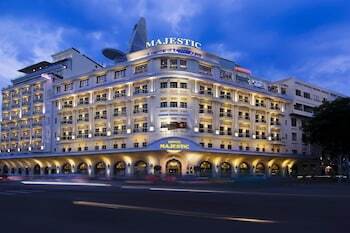 What other types of accommodations are available in Ho Chi Minh City? Explore Ho Chi Minh City with Expedia.ca’s Travel Guides to find the best flights, cars, holiday packages and more!